Arcadia Earth Mix Bio-Active vivarium and terrarium substrate is a potent organic mix made in the UK to the highest possible standards by experts and has been formulated for use with live animals. Arcadia Earth Mix contains full spectrum minerals and is pre-loaded with organic matter including Worm Manure to ensure fantastic plant growth and of course active support to bio-active custodians. 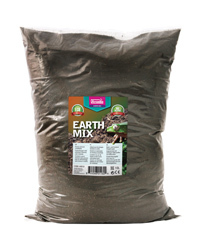 Arcadia Earth Mix contains volcanic particulates to ensure fantastic drainage and to aid with mineral provision for plants and live animals. Arcadia Earth Mix has been designed to be able to be used in all types of enclosure and can also be easily used as a dry substrate for arid species. Bio-active systems for captive exotics not only help to sustain plant growth but they also help with maintaining humidity and represent a usable and ready source of safe nutrition. Great product which gives good results in a biotope type set up.